> > I'll try to confirm. > > only at or just below a U block shift fracture. > > Everything else I can find seems clear. > above or below. Observations anyone? The lighting is misleading; they're not niches carved into the stone, they're iron L-bars that were installed on top fo the stone in recent times as part of a "restoration" to prevent more fragments of GG from breaking off. Not sure I've seen evidence of a coating that's currently on the walls of the GG, but there are plenty of chisel marks that indicated something was once chiseled off that once adhered to those walls. 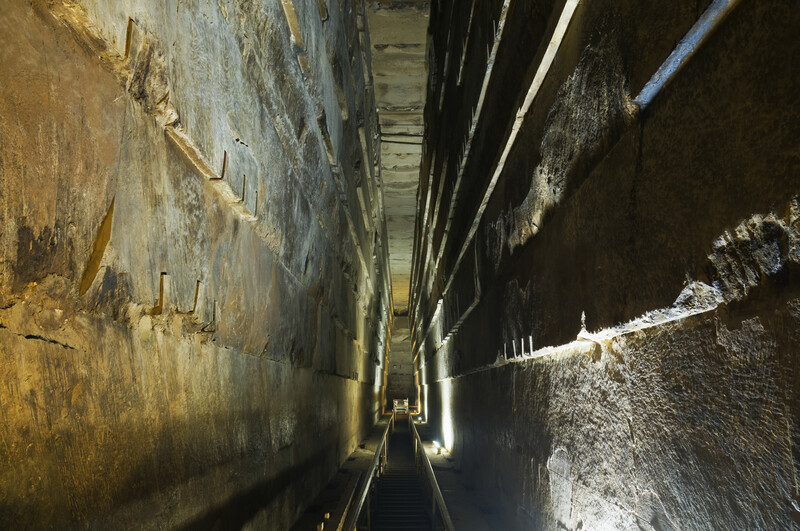 It's very clear in some photos of the Long Groove (a feature we don't see in any of the pyramids attributed to Sneferu). Also, there seems to be chisel marks on several of the 26 pairs of recesses of alternating size (yet another feature not seen in any Sneferu 'mid) along the GG's bench ramps that suggest something was chiseled out of them, too.